Once you have selected your Gemstone Vacation Home you may either book direct from our web site or contact the office to be connected to one of our vacation home specialists who will be happy to assist you. Call 407-397-1128. The deposit amount required is 25% of the rental stay or $250 deposit whichever is greater. Balance due in full 7 days prior to arrival date. Yes, the total includes tax and cleaning fee. Extra services such as pool heating or BBQ delivery is not automatically included. Please order any additional services at time of reservation or directly through the office at 407-397-1128. Is the home I book the exact home advertised on line? 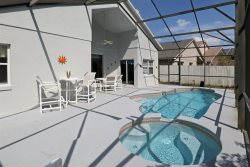 Yes, unlike most vacation rental companies, we rent the specific property you see in full detail on our website. We believe that this is the best way to ensure guest satisfaction with accommodations. Why should I choose a Gemstone Home? Dedicated 24/7 Guest Services assistance for the length of your stay. Check-in time is after 4:30 p.m. and Check-out time is before 10:30 a.m.
***Arrangements can be made for after-hours arrivals as well as early and late check in when available. What is your change/cancelation policy? Changes & Cancelations Reservations can be changed or canceled prior to 60 days before arrival date and will be subject to a $50 administrative fee. Any reservation canceled within 60 days of arrival will result in retention of the reservation deposit. There are no refunds for late arrivals or early departures. Please make sure that Gemstone is added to your approved senders list to insure you receive any correspondence from our office regarding your stay. What if we leave something at the property after we depart? When checking out, what do we need to do? Please be sure the home is locked and key placed back in the lock box. How many people do the homes accommodate? Due to local hotel codes the occupancy may not exceed the allowable amount of guests per home. Maximum occupancy includes infants and children. The following outlines the typical maximum occupancies for each home, unless otherwise posted. You can find the maximum occupancy listed on the property page for each individual property. Can we heat the pool? For homes with a pool/spa, heat can be added to your reservation for an additional fee. Pool Heat Policy; Pool heat must be ordered for a minimum of 3 days. Gas heaters $35 per day plus tax. Electric Heaters $25 per day plus tax. When ambient temperatures fall below 70 degrees pool equipment will struggle to reach the guaranteed 80 degree water temperature. Guest must report unsatisfactory water temperatures within 24 hours of arrival. Refunds approved after 48 hours of unsatisfactory report is made and 80 degree temperatures are not reached. Gemstone holds no responsibility for increment weather or equipment malfunction. You will receive a pool heat addendum with your confirmation package, which states that pool heaters have electrical/mechanical components that can sometimes break. We will do everything in our power to rectify any problems with malfunctioning equipment as quickly as possible. Community pools are heated at the discretion of the governing home owners association. Some of our homes are Pet Friendly with additional cleaning fees and deposits. Should you require a pet friendly home please contact the office for pricing and availability. Is there a fully equipped kitchen in the vacation homes and town homes? Is there a telephone and wifi at the home? Each of our properties has a telephone and wifi available for guests use. Most of our homes include free limited long distance calling. In certain circumstances you will be required to purchase a calling card to access international long distance services. Please refer to your registration paperwork for the telephone number and wifi information. The telephone number to the property will be displayed in your rental agreement. Yes, there are linens and towels provided in each home. All bedding is provided and towels are supplied at twice the maximum occupancy. Note: Beach/pool towels are not included with our homes unless otherwise indicated. No, our homes are cleaned before your arrival and after your departure. You may request a mid-stay clean at an additional charge. Mid-stay clean includes washing all sheets and towels, cleaning the bathrooms, kitchen area, vacuuming, dusting, sweeping, mopping, and refreshing your starter paper products. We do not leave any chemicals in the homes. There is a mop, broom, dustpan, vacuum, iron and ironing board in the property. Our homes also include a washer, dryer, dishwasher and starter products. Each home is supplied a complimentary starter pack of can liners, toilet paper, dish soap, hand soap, coffee and paper towels. Gemstone does not replenish these items during your stay. *Additional supplies or replenishments to those listed above will be the responsibility of the guest. Yes. Please contact our Reservations Team for a list of handicap accessible properties. If you and your group will be arriving with more than two vehicles, or any oversized vehicles, please call our office at 407-397-1128 in advance of your arrival to inquire about the parking availability for the home you have rented. Also, please inform any guests who might be visiting for the day or evening that parking is very limited. Typically, parking is not available at the properties for RVs, buses or trailers. Please contact our office if you need to make specific parking arrangements. Our office hours are from Monday through Friday 9:30 a.m. to 5:00 p.m.-Saturday's phone lines open 9:00 a.m. to 3:00 p.m.- closed on Sundays. What is standard in my vacation home?